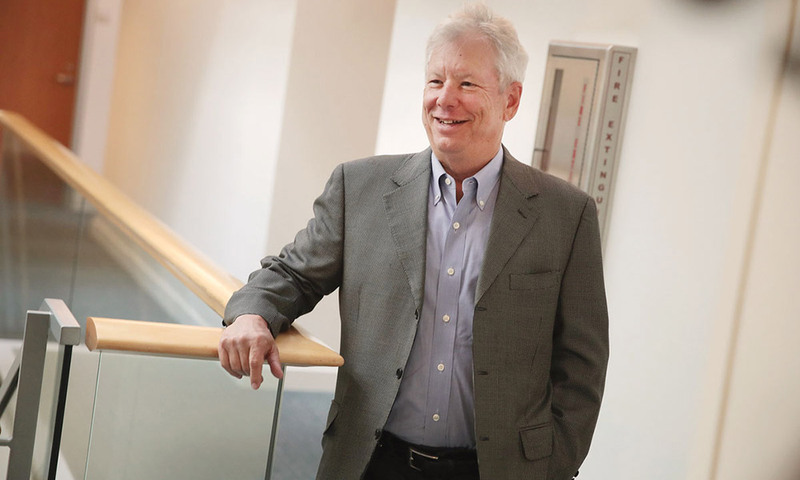 Richard Thaler ’74 (PhD), the Charles R. Walgreen Distinguished Service Professor of Economics and Behavioral Science at the University of Chicago’s Booth School of Business, has a prized item on the wall in his home office. It’s “the best thing that has happened so far,” he says about the immediate aftermath of winning the 2017 Nobel Memorial Prize in Economic Sciences this past fall. “It” is a congratulatory letter from former President Barack Obama, a fellow Nobel laureate and erstwhile Chicago faculty member. “That was very thoughtful of him,” says Thaler, who earned his PhD at Rochester in 1974, and taught at the University until 1978. Thaler became a multi-disciplinarian well before it was hip. Recognized by the Nobel committee for his contributions to behavioral economics—a field that he helped create—Thaler’s research bridges the gap between economics and psychology. At its core is the premise that people usually behave in human ways, rather than in ways that are more rational and selfish, which had been the standard economic assumption. The sixth alumnus to receive the prize, Thaler is Rochester’s ninth Nobel laureate and the second in economics after former faculty member Robert Fogel, one of Thaler’s teachers. You’ve said that for the last 50 or 60 years, economists have devoted themselves to studying fictional creatures. “They might as well be studying unicorns,” you said. That must have really endeared you to fellow economists. Yes, it did not go over well at the Simon School where I was teaching, so I had to leave Rochester for Cornell. I told people I was moving south for the weather. Where was that “gigantic house in Rochester” where you left the cashews in the kitchen so as to reduce your and your fellow graduate students’ consumption? It was certainly not a gigantic house. Probably graduate student housing. Later I lived on Stanford Road near the hospital. Do you have more friends in the field now that you have won the Nobel Prize? No, but I have heard from many old friends, even some from childhood. That has been great fun. But the best thing that has happened so far is getting a personal note from President Obama. That was very thoughtful of him. You joked that you would spend the 9 million Swedish krona prize money as irrationally as possible and called it “fun money.” Have you started? On what? How do I know which money I am spending? I call this “mental accounting.” So far the main application was during our annual year-end charitable giving exercise. We gave all our favorite charities a raise. 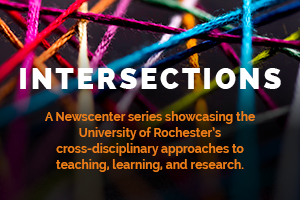 What were you obsessed with in Rochester when you worked on your PhD here? Besides cashews and garbage plates—intellectually, I mean? My PhD thesis, supervised by Sherwin Rosen [the late Rochester labor economist], was on the value of a human life. It was a very standard economic exercise, estimating how much you had to pay people to take risky jobs, but I did ask some questions that piqued my interest. I asked people how much they would pay to eliminate a 1/1000th risk of death and how much they would have to be paid to accept an increased risk of death of 1/1000th. The answers differed wildly, often by several orders of magnitude. Standard economic theory said they should be about the same. That got me thinking deviant thoughts. During that time you read a paper that had just been published by psychologists Daniel Kahneman and Amos Tversky—“Judgment under Uncertainty: Heuristics and Biases.” This one paper altered the course of your work, your life. How? They had one key idea that made my research possible, namely that people made predictable errors in judgments. Economists were happy to admit that people made mistakes but they thought the mistakes would just wash out and add random noise. The idea of systematic bias was fundamental. You came up with the idea of sunk costs because of a snow storm in Buffalo . . .
May we call you the father of behavioral economics? When did you realize that you were on to something that would either shake up your field or make you a total outcast? Some have called me that, though the field has many creators. And yes, it did make me an outcast in some places, including Rochester. I think that will still be the case now at the Simon School. In your latest book Misbehaving: The Making of Behavioral Economics (W. W. Norton, 2016), you tell stories of things that people do that don’t make sense in traditional economic theory. Is most of the traditional theory rubbish? No, economic theory is not rubbish. In fact, it is essential to what I do. But economic theory is about how people “should” behave if they want to be rational. We need that theory, but we also need other theories to say how people actually behave. In return, a colleague accused you in 2004 of being a “paternalist”—have you made peace with that title? Or is “professional nudge” better? My colleague and I call it libertarian paternalism because it is true that we are trying to help people (the paternalistic part), but we try to do so without requiring anyone to do anything (the libertarian part). That is what our book Nudge [written with Harvard Law School Professor Cass Sunstein] is about. Listen here to Thaler’s Nobel Prize lecture “From Cashews to Nudges: The Evolution of Behavioral Economics,” in which he mentions the Rochester dinner party with the cashews as an example of how his everyday life experiences often turn into ad-hoc field experiments.